The Rev. Jaime Clark-Soles, an associate professor of New Testament at Perkins School of Theology, is co-teaching a class titled “Scriptural Representations of Disability” at the 2014 Summer Institute on Theology and Disability. The Rev. Jaime Clark-Soles didn’t hesitate when given the chance to involve herself and Perkins School of Theology in the 2014 Summer Institute of Theology and Disability. Considering and acting on issues pertaining to disability — everything from building access to the religious dimensions of suffering — strikes her as a clear priority. 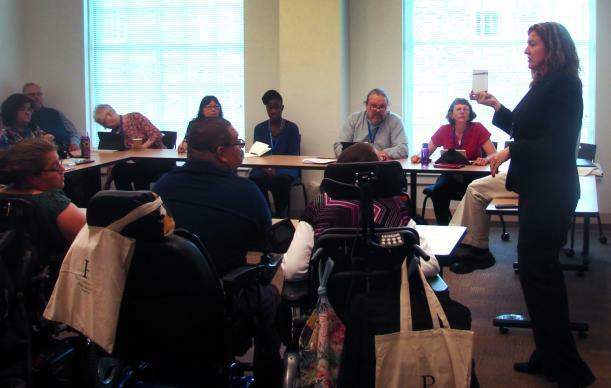 The Summer Institute on Theology and Disability draws people from around the world — scholars, people with disabilities, parents of disabled children, clergy and other church workers. They gather for classes, workshops, plenary sessions and networking. This year’s institute began in earnest on Monday and runs through Friday at Perkins, part of Southern Methodist University in Dallas, and at next-door-neighbor Highland Park United Methodist Church. Plenary sessions and meals are in Highland Park United Methodist’s Great Hall. Workshops and classes are at Perkins. Daily attendance is running about 110-115, with special events drawing more. The event, sponsored by the Bethesda Institute, is in its fifth year, but this is the first time it’s been hosted by United Methodists. The director, the Rev. Bill Gaventa, relocated to Texas last year, and has been working with theTexas Faith Inclusion Network for People with Disabilities and their Families. So he hoped to find a Texas location for the institute, which has twice been in Gettysburg, Pa., and once each in Chicago and Toronto. Gaventa said he first approached Clark-Soles, whose theological writing about disability he knew and who this week is co-teaching a class titled “Scriptural Representations of Disability.” He said she enlisted the support of the Rev. William Lawrence, dean of Perkins, and the Rev. Connie Nelson, Perkins’ director of public affairs and alumni relations. The Perkins team knew of Highland Park United Methodist’s commitment to special needs ministry, including four Sunday school classes, a theater program for special needs kids, and “Night OWLS (Out with Loving Sitters),” which twice a month provides parents a night off from caring for special needs children and siblings. At Perkins officials’ request, Highland Park agreed to co-host the institute, where motorized wheelchairs, guide dogs and personal attendants are rather commonplace. “It’s a wonderful opportunity so that more of our membership can understand the scope of integrating those with special needs,” said Cheryl Vandiver, director of special needs ministry. The field of theology and disability is old enough to have touchstone books, such as “Adam: God’s Beloved,” by the late Henri J.M. Nouwen, That 1997 volume recounts how Nouwen’s faith was influenced by his friendship with a severely handicapped man. Jennifer Cox, who has a high-functioning autistic child and has written articles on theology and disability, flew 21 hours from her home in West Australia to be at the institute, drawn in part by its marquee names. Greg Little plans to seek ordination as a United Methodist deacon and just earned his master of divinity from Duke Divinity, where he had a directed study in disability theology, reading works by Hauerwas, Reinders and Swinton. Little chose to supplement his seminary education by coming to the institute, where he can hear those authors and others. Reinders and Gaventa both noted that the institute differs from other scholarly gatherings in that it’s not just scholars talking to one another. People with disabilities, parents and practitioners are fully part of the mix. Sometimes the scholars are the disabled, such as the Rev. Helen Betenbaugh, a retired Episcopal priest with a spinal disorder who gave her talk Monday from her motorized wheelchair. The talk carried a formidable title — “Disability: Theology in Liminality” — but proved an accessible account of transitions, or what Betenbaugh calls “marker events,” in the lives of disabled people and others. “I think exploring these issues and working through them from various traditions and various experiences of disability — I think it’s wonderful. I think it’s exciting,” she said before her address. Another presenter, the Rev. Leslie Neugent, is the mother of a special needs child, and founder ofParables, a “special needs-friendly” worship service at Wayzata Community (United Church of Christ) Church, in Wayzata, Minn. Her Monday workshop was practical, laying out all that’s worked well in that service, including having lots of singing, communion every week and letting disabled congregants lead the responsive reading. Neugent’s presentation was realistic but also upbeat, reporting on the attendance growth of Parables and sharing the testimony of families who’d previously felt unwelcome in church because their special needs kids’ behavior was unpredictable. At the institute, honest discussion is encouraged, and Neugent got some pushback, in the form of a polite-but-firm question as to whether segregating special needs kids in a separate service is really the way to go. Neugent acknowledged having wrestled with the question.